IAAF World Championships Finalist (400H), NCAA Outdoor First Team All-American (400H, 4-x-100), NCAA Indoor First Team All-American (4-x-400) … Began the season placing third in the 60-meter hurdles at the Arkansas Invitational … Finished fifth in the 400 with a PR of 47.15 at the Tyson Invitational where he also ran a 200 PR of 21.07 … Set a new personal best of 7.94 in the 60-meter hurdles at the Arkansas Qualifier … Placed fourth in the 4-x-400-meter relay at the SEC Indoor Championships … Closed out the indoor season earning a bronze medal with the 4-x-400-meter relay team at the NCAA Indoor Championships … Opened the outdoor season capturing the 400-meter hurdle title at the Baylor Invitational, where he also finished as the runner-up in the 110-meter hurdles … Secured two more 400-meter hurdle event titles at the John McDonnell Invitational and the SEC Relays … Scored 12 points individually for Arkansas at the SEC Outdoor Championships, winning gold in the 400-meter hurdles and placing seventh in the 110-meter hurdles … Qualified for the NCAA Outdoor Championships in the 400-meter hurdles and with the 4-x-100-meter relay team … Completed the collegiate season with a national bronze medal in the 400-meter hurdles off a program-record performance (48.49) and as a seventh-place finisher with the 4-x-100-meter relay team … Qualified for the IAAF World Championships as the Jamaican National Championships runner-up in the 400-meter hurdles … Closed out the year as the highest finishing collegian in the even, one spot shy of the podium in fourth place. 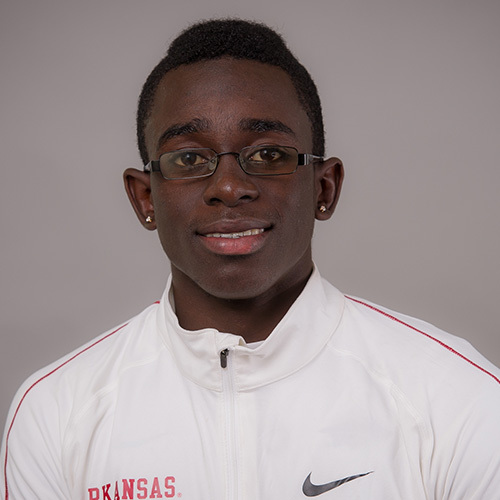 NCAA Outdoor First Team All-American (4-x-100), NCAA Outdoor Second Team All-American (4-x-400) … Started his career as a Razorback with a fourth-place finish in the 60-meter hurdles a the Arkansas Invitational (1/15) … Went on to help Arkansas to a fifth-place finish in the 4-x-400-meter relay at the SEC Indoor Championship (2/27) as the lead leg … Earned Second Team All-American honors at the indoor national meet with the 4-x-400-meter relay, … Kicked off the outdoor season with a third-place finish in the 400-meter hurdles at the Texas Relays (4/1) … Went on to place fourth in the intermediate hurdles at the SEC Outdoor Championship (5/14) … Earned First-Team All-American honors as a member of Arkansas’ third-place 4-x-100-meter relay team at the NCAA Outdoor Championship (6/10). Finished fifth at the Southland Conference Indoor Championships in the 60-meter hurdles … Placed third at the Southland Conference Outdoor Championships in a personal best 51.13 in the 400-meter hurdles … Qualified for the NCAA first round in the 400-meter hurdles narrowly missing advancing on with a 10th place finish. Ran track at Munro for coach Neil Harrison…Was the team captain and Athlete of the Year. Son of Sylvia Williams and Donnovon Mowatt… One sister; Sonya Collins… Majoring in Geology.